Willem Reeders' system of martial arts relies heavily on explosive movement. All strikes and movements must be performed explosively to cause maximum damage and minimize any advantage an opponent may have. Because of the explosive, continuous and fluid movement of the kuntaoer, if an opponent is not incapacitated by the first or second strike, the opponent will often be reacting to strikes that have already been delivered. An opponent may be up to five or six strikes behind. Reeder's Kuntao still retains its old school combat orientation with techniques that are designed to seriously injure or kill an attacker. The essential premise of the art is that for self-defense to be adequate it must take into account the worst possible scenario in which you could find yourself, in a fighting context. Accordingly, this would be having to face multiple, armed attackers who are versed in the martial arts as well. This assumption lays the theoretical basis for the art. 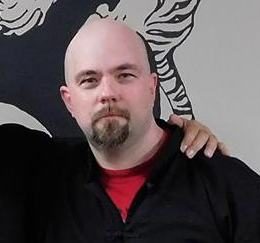 Eric Baker was born in Pennsylvania in 1973, he began his training in Kune-Tao in 1989. He has continued to actively pursue Kune Tao as taught in the spirit of Willem Reeder's lineage. He trained directly under the supervision of (Grandmaster) Bob Servidio and (Master) Scott Young, he also studied with instructors George Etzel and Chris Durbaum. In 2000 Eric relocated to Anchorage, Alaska were he resides with his family. Eric served 6 years in the U.S. Army (Airborne Infantry) and is currently working in law enforcement as a Correctional Officer. During his professional career in the military and corrections he has been called upon to deal with numerous violent situations, Kune Tao has proven very useful in these areas and life in general. Eric now teaches Kune Tao in the Anchorage area, where he has an advanced adult class, kids classes and offers private instruction.